We don't eat a lot of red meat. I just did a quick look through my food posts and there is exactly one... just one... dish that has red meat in it. It's not that we don't like red meat (Nate would to eat it a lot more then we do) but for health reasons and due to the fact that I have an aversion to meat fat (which means I prefer the pricier cuts) we just don't eat it much. Enter the meat grinder. Our friends gave us the meat grinder attachment as a wedding present and it is pretty awesome. You can grind combinations of meat and add ingredients like sun dried tomatoes or cheese or anything you want. We also get cheap cuts of meat and cut all the fat off and grind the good stuff up. 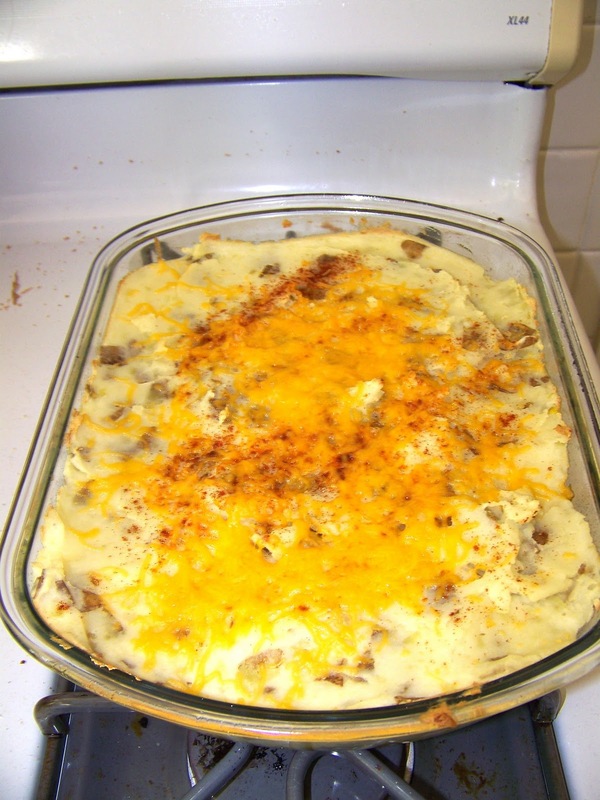 For the Shepard's pie, we ground pork and chicken together with whole cloves of garlic. We then let the meat sit overnight in the refrigerator to give it a really nice flavor. Saute the ground meat until cooked and slightly browned. Preheat the oven to 350 degrees F. In a glass backing dish, spread the meat and spread the corn on top of the meat. Top it off with the mashed potatoes. Sprinkle with cheddar cheese and bake until the it is bubbly (you can see it through the sides) and the cheese is melted. Sprinkle with paprika and Enjoy!